The Alpine A110 also known as the "Berlinette" was produced from 1961-1977. It was introduced in 1961 as an evolution of the A108 and like other road-going Alpines made use of mass-produced Renault components. But while the A108 was designed around components from the Dauphine, the A110 was updated and used many parts from the Renault 8. The A110 was originally available with the 1100 R8 Major or R8 Gordini engine (which produced 95 bhp at 6500 rpm). During its production run the A110 was powered by various Renault engines from 1100cc - 1600cc derived from those found in the R8, R12, R16 & R17 in various states of tune. Unlike the A108 which was available first as a cabriolet and then later as a coupé, the A110 was produced only in coupé or "Berlinetta" form. The main visible difference with the A108 coupé being a restyling of the rear body that gave the car a more aggressive look. Like the A108, the A110 featured a steel backbone chassis with fibreglass body. The A110 achieved fame in the early 70s as a successful rally car. After winning several rallies in France in the late 60's with the cast-iron R8 Gordini engines the car was fitted with the aluminium block from the R16 TS engine. With two twin choke Weber 45 carburettors the new engine was able to deliver 125 bhp at 6000 rpm. This allowed the production 1600S to reach a top speed of 210 km/h. The car reached international fame during 1970 -1972 competing in the newly created "International Rally Championship", winning several events around Europe and became considered to be one of the best rally cars of its time. Amongst notable performances, in 1971 the car achieved a place in the history of the Monte Carlo Rally with 3 cars in the first 3 places: Swedish driver Ove Andersson preceding Thérier and Andruet. In 1973 the International Rally Championship was replaced by a new "World Rally Championship". 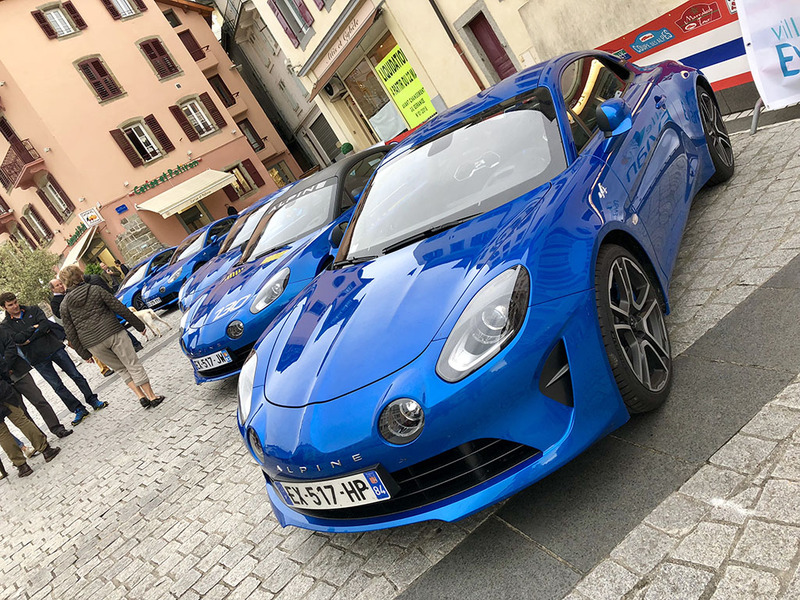 Following their recently completed buy-out of Alpine, Renault decided to compete in the World championship with the A110. With a team featuring Bernard Darniche, Jean-Pierre Nicolas and Jean Luc as permanent drivers and guest drivers like Jean Claude Andruet the A110 won most races where the works team was entered. Alpine dominated the Monte Carlo Rally with 5 official cars finishing in the top 6: Andruet 1st - Anderson 2nd - Nicolas 3rd - Thérier 5th - Piot 6th, repeating the 1, 2, 3 of 1971. Driven on by this success the Alpines won 6 more victories culminating in the first World Rally Championship title. In 1974, Alpine and Renault, having nothing to prove in rallying, concentrated their efforts towards building prototypes, the goal of which being victory at the Le Mans 24 hours. At the same time, it was becoming apparent that the A110 had reached the end of its development. Attempts to use fuel injection had brought no performance increase. On some cars a DOHC 16-valve head was fitted to the engine but proved unreliable. Chassis modifications like the use of the A310 double wishbone rear suspension (homologated with the A110 1600SC) also failed to increase performance. On the international stage the A110 (along with many other rally cars of the same age) was soon obsolete. It was the end of an era. Spain under the name FASA from 1967 to 1978. Brazil under the name Interlagos from 1965 to 1966. Mexico under the name Dinalpin from 1964 to 1972 Diesel Nacional (DINA) which also produced Renault vehicles. Bulgaria under the name Bulgaralpine from 1968 to 1970 by a cooperative formed between SPC Metalhim and ETO Bulet, whose collaboration also resulted in the production of the Bulgarrenault. These vehicles (other than those with competition history) are generally considered to be worth less than the equivalent Dieppe built model. Please note that these are the official production numbers for vehicles built at the Dieppe Alpine factory. They do not include figures for vehicles built under license in other countries (e.g. Brazil, Bulgaria, Mexico & Spain). *The production number breakdown by year for the 1100 models was not recorded. Only the total production numbers are given for these models. The total production run for Dieppe built A110s is stated by the factory as 7500 vehicles. This figure does however seem conveniently neat and is often open to debate.